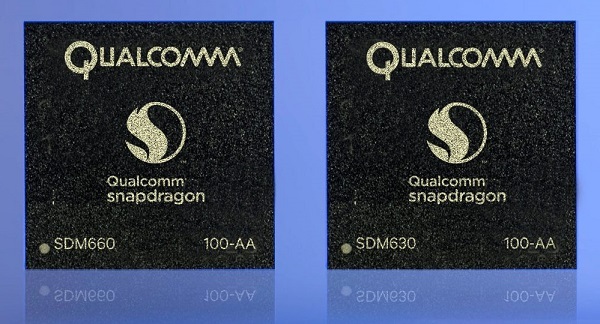 Qualcomm Snapdragon 660 and 630 processors announced with Quick Charge 4 and Bluetooth 5. Qualcomm today announces new Snapdragon 660 and 630 mobile platforms. From the Snapdragon 653 to the 660 and the 626 to the 630 - Qualcomm Technologies is pumping up its 600-tier mobile processors to include features typically found in higher-tier processors. In a nutshell, both platforms are engineered to support superior connections, capture true-to-life photos, include the building blocks for artificial intelligence, and to deliver improved battery life, performance, and security compared to previous generations. To give these new platforms even more of a kick, Qualcomm is bringing features to its Snapdragon 600-tier platform that were previously only found in the 800 tier, including the Qualcomm Spectra camera ISP, Qualcomm Kryo CPU, and Hexagon Vector eXtensions (HVX). + The 14-bit Qualcomm Spectra 160 ISP supports cameras that capture up to 24 megapixels single ISP images with zero shutter lag. Spectra is also designed to deliver smooth zoom, lightning-fast autofocus, and true-to-life colors for vivid photos. + 4K video capture and playback is integrated, so users can record high-definition videos at 30 frames per second, straight from the device. The Snapdragon 630 supports up to 13MP + 13MP for dual cameras, while the 660 bumps that up to 16MP + 16MP. The 660 is also equipped with the Qualcomm Hexagon 680 DSP, which incorporates HVX. HVX is designed to support higher camera performance by taking on tasks traditionally handled by the ISP through advanced computer vision and powerful yet efficient image processing. OEMs and developers can power immersive user experiences with machine learning on both of these new Snapdragon mobile platforms, using the Snapdragon Neural Processing Engine SDK. With the help of the SDK, when designing for artificial intelligence, developers have the flexibility to target the core of choice that best matches the power and performance profile of the intended user experience. They can create a feature or an application that uses deep neural networks to improve the performance of a particular task, like scene classification, facial recognition and object tracking, voice and language detection, and filtering out background noise. The SDK is engineered to support convolutional neural networks, LSTMs (Long Short-Term Memory) expressed in Caffe, Caffe2 and TensorFlow, as well as conversion tools designed to ensure optimal performance on Snapdragon heterogeneous cores. + Qualcomm EcoPix display technology is designed to allow easy viewing even in harsh sunlight. + Improved Qualcomm TruPalette technology is made to display accurate colors that match what you see in "real life" with what's seen on screen. + The Qualcomm Aqstic audio codec is engineered to deliver Hi-Fi audio - quality fit for recording studios - on the go. It supports up to 192-kHz/24-bit playback, with extremely low distortion and high dynamic range. With the Snapdragon 660 platform, the multimedia experience isn't restricted to your smartphone screen. Plug a Snapdragon 660 powered smartphone directly into a 4K television via a display port and you can watch 4K videos on the big screen. In addition to these technologies, the Snapdragon 660 supports 2x2 MU-MIMO 802.11ac Wi-Fi. That means a stronger signal. This is especially beneficial in houses and offices made of thick brick and concrete walls, engineered to allow for a better connection in the entire space without coverage dead spots. Compared to its predecessor, the Snapdragon 653, the 660 is designed to support up to 2X the data throughput, allowing users to enjoy unfettered video, faster downloads, and an excellent connectivity experience. + Qualcomm All-Ways Aware technology, a sensor hub engineered to continually collect data without gobbling up battery life. The hub collects and processes information, allowing devices to track location, sense motion, and predict behavior. + Qualcomm Quick Charge 4 is designed for up-to 20 percent faster and 30 percent more efficient than its predecessor. Five minutes of charging can power 5 hours of talk time; 15 minutes of charging can bring a phone's battery up 50 percent. Both mobile platforms' GPU and CPU offer a step up in performance compared to their older counterparts. The Snapdragon 660's CPU and GPU have also been upgraded. The platform's Kryo 260 CPU, an octa-core configuration, is designed to contribute to an overall 20 percent improvement in performance over the Snapdragon 653. A Qualcomm Adreno 512 GPU is designed to offer up to a 30 percent improvement in performance compared to the previous generation, the Adreno 510 GPU. The Snapdragon 630 platform is outfitted with the Adreno 508 GPU, engineered to support lifelike visuals, efficient rendering for 3D graphics, and an up-to 30 percent improvement in performance compared to the Adreno 506 GPU. Its eight-core CPU is engineered to perform 10 percent better than the Snapdragon 625 processor. Qualcomm mobile security, which comes with both platforms, provides a comprehensive suite that supports advanced, biometric authentication technologies. This includes fingerprint scanning, iris scanning, facial recognition, and voice prints, designed to help to ensure protection for a device's hardware and software. The Snapdragon 660 and 630 mobile platforms are a solid step up from prior 600-tier processors, created to get the most out of what OEMs offer. The Snapdragon 660 platform is available now while the Snapdragon 630 platform is expected to ship towards the end of this month.